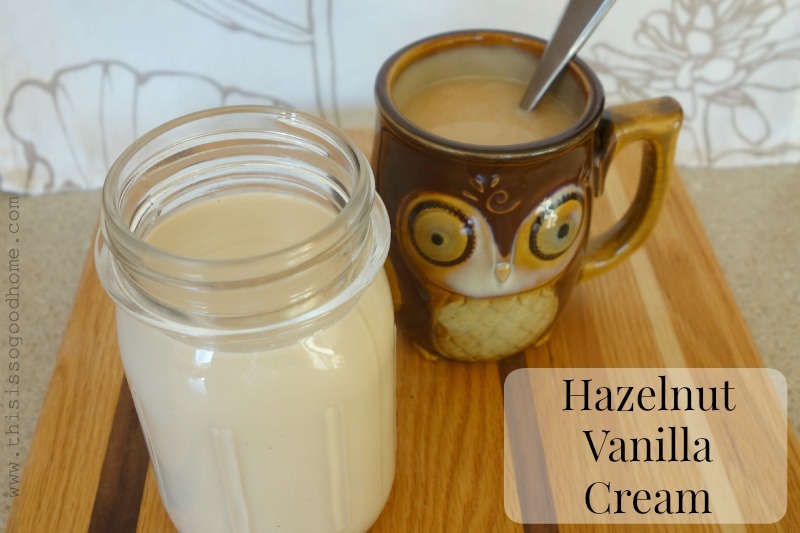 Today, I want to share with you how easy it is to make hazelnut vanilla coffee creamer at home. This recipe skips all the junk found in those store-bought coffee creamers and is perfect for that morning cup of ‘joe or tea. I recently wrote a blog post on how and why I decided to finally kick my coffee habit. Now don’t get me wrong, I love a warm mug with a delicious drink in my hands! One of my favorite treats is sitting down to read a book or watch a funny movie with something delicious to sip on. After ditching the coffee, I have found that there are plenty of satisfying options out there to meet my cravings. 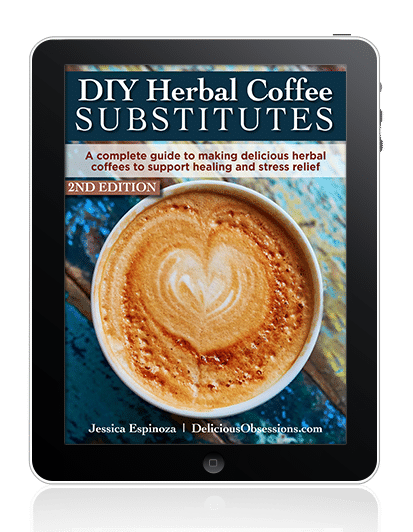 Rooibos teas (read about the health benefits of rooibos tea here), herbal teas, and Jessica’s herbal coffee blends are some of my favorites. All of these provide me with that warm, delicious cup of goodness and the recipe that I’m sharing with you today takes these beverages to the next level! And no worries, if you are a happy coffee drinker, my Hazelnut Vanilla Cream is perfect for your regular cup of joe too! This recipe is Dairy-free, Paleo-friendly, Vegan, and SCD-legal as well. I’ve been making my own nut milks for years. 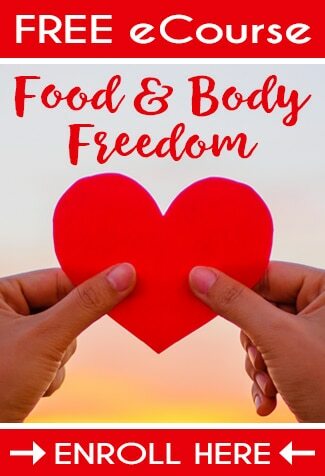 There are a few reasons why I choose to do this: I’m in control of the ingredients and can buy the highest quality nuts and seasonings, there are no added gums or stabilizers, and it just tastes better! Really, once you try homemade nut milks you will never want the store bought stuff again. This goes double for things like flavored coffee creams! 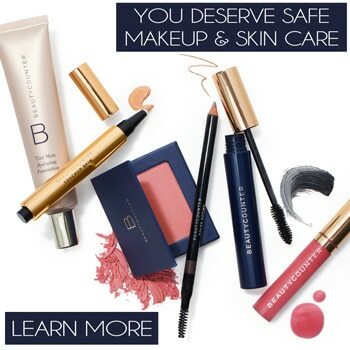 Have you looked at the ingredient list on those – holy moly… What is all that stuff? But what’s a girl to do when she really loves Hazelnut flavored coffee and tea? Make a clean version at home! So here we go! Let’s get to the recipe. If you have questions about why I soak the nuts in salt water before processing, please check out my Crispy Nuts post for details. Place the 2 cups of raw hazelnuts in a large glass bowl and add the ½ tablespoon of sea salt. Add enough filtered water to cover the nuts by a couple of inches. Stir to dissolve the salt and cover the bowl. Set it aside for 8-12 hours. After soaking the nuts for 8-12 hours, drain them and rinse with cold water. Place the nuts in a blender with 2 cups of filtered water, the vanilla beans, and the dates. Blend on high for 1 minute (the mixture will be pretty thick). Pour the mixture into a nut milk bag or a mesh strainer lined with 3-4 layers of cheesecloth. Gently squeeze out the liquid into a bowl, leaving the solids behind in the bag or the cheesecloth. I like to store my Hazelnut Vanilla Cream in a small Mason jar. Keep the cream refrigerated for up to a week. NOTE ON THE NUTS: I have made it with both the skins on and the skins removed from the hazelnuts and have not found there to be a huge difference in flavor. If you prefer to remove the skins, I would toast the nuts in the oven for 20-30 minutes at 300 degrees and then rub the skins off with a kitchen towel before soaking them. Since the nut milk bag captures the pulp in this recipe, I usually don’t worry about it as it’s an extra step and a lot of work! So, what do you think? Have you made your own coffee creamer before? Leave a comment below! Do you leave the skins on the nuts? I have made it both ways and have not found there to be a huge difference in flavor. If you prefer to remove the skins, I would toast the nuts in the oven for 20-30 minutes at 300 degrees and then rub the skins off with a kitchen towel before soaking them. Since the nut milk bag captures the pulp in this recipe, I usually don’t worry about it as it’s an extra step and a lot of work! Hope this helps! I just throw the vanilla beans into my blender whole. You are straining the mixture through a nut milk bag, so it will capture all of the pulp and the fibrous part of the vanilla bean. This recipe would work just as well if you scraped the seed out of the pod and added it to the blender. Your choice! Thanks for the question! Enjoy! Is there any use for the hazelnuts after straining? Seems like a waste to discard them. Any thoughts or suggestions? The creamer turned out great! Can’t wait to have it in my coffee tomorrow! Hi Miri – The salt is used to soak the nuts and help reduce the phytic acid. While this process it’s not required, it does dramatically help with digestibility of any nut or seed. I strongly encourage everyone to soak their nuts and seeds before consuming. Here’s why: http://www.deliciousobsessions.com/2011/02/soaking-nuts-seeds/. Hope that helps!